Between Thanksgiving travel and the fact that I work from home and walk Gabriel to childcare a half-block away, trips by bike have been pretty minimal. I rode to my [final?] PT appointment last Wednesday in fifty degree temps, and by Friday our streets were covered with a fun mix of ice and snow. Not much ice and snow by most standards, but enough to make things interesting in a city that doesn’t plow or salt the side streets. I don’t mean that these streets don’t get priority, I mean that these streets, including the street we live on and many of the surrounding east-west streets, don’t get plowed or salted EVER. If it stayed below freezing until April, snow and ice that fell in December would STILL be there. Fortunately, St. Louis winters tend to be pretty mild, current unseasonably cold December temps notwithstanding (ahem), and the ice usually melts in a somewhat reasonable amount of time. Six-days post-precipitation most of the streets are clear, but, as of this morning, our street still had significant ice. Matthew’s been busing to work since last Friday, and I’d been delaying errands, hoping for just a bit more thawing so I could get around by bike instead of resorting to the car. We’ve both been missing the regular dose of physical activity! This morning, I finally decided that enough was enough — it was time to venture out on the bike. 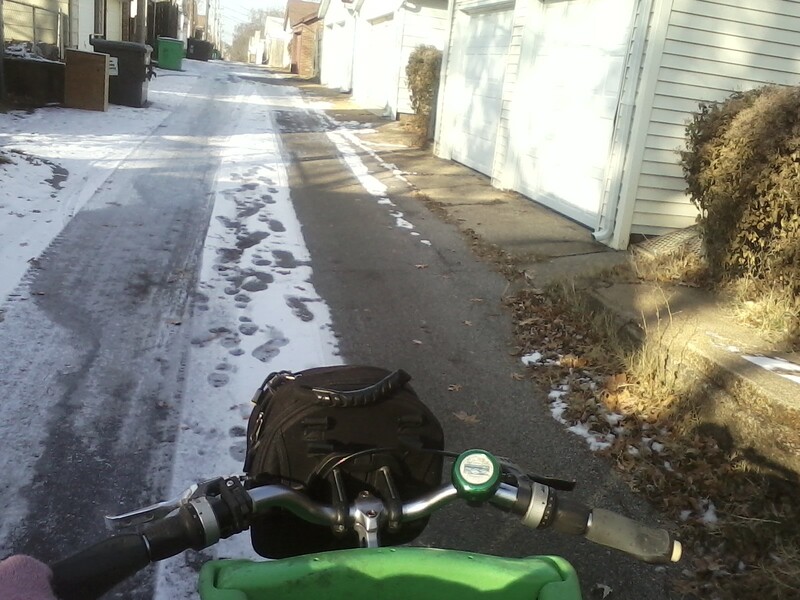 The view of our alley from my handlebars looked a bit dicey. This was by far the worst I encountered, and, despite a couple of deceptive clear patches, I didn’t even attempt to ride in the alley. Instead, I walked my bike to the street, where I found [almost] nothing but clear pavement. The risk, of course, is that a small patch of ice that would be completely inconsequential in a car can be a big deal on a bicycle. I rode a total of two blocks that had a decent bit of ice on the roadway, and I rode very slowly and cautiously, sticking to the clear pavement in the tire tracks. Other than those blocks, I stuck to larger, completely clear roads. Given the roads I was using, and my flexible schedule, I realized later that I could have waited until after morning rush hour to run my errands, but the timing/heavy traffic thing didn’t occur to me in my haste to get out the door and on my bike. It looks like our roads will be mostly clear just in time for some more wintry mix this weekend (boo, hiss). I consider myself an [almost] all-weather cyclist, but I have a long way to go before I join the ranks of Miss Sarah. On the other hand, it’s hard to feel like going to great lengths to prep for winter-weather riding in St. Louis, where we have relatively little snow. Perhaps I just need to move somewhere with no winter weather! This entry was posted in Biking and tagged winter. Bookmark the permalink. I need to get my 1990s mountain bike into the shop to check a crack in the front-shock frame and get it refit – think I want new handlebars and I hate the current grips (um, they shouldn’t dig triangle shapes into your hands – that’s not very nice). Am considering leaving the knobby tires on to have a meaningful dirt-road and winter-bike option. I was thinking about trying to cycle to work this morning, but would like it to be a touch warmer (an hour in 16F temps is daunting, to be honest), and I have picked up another icky cold, so now I’m also waiting to feel better. I agree that we can usually count on a relatively-high number of pretty-mild days, but other than the warm few days after Thanksgiving, it’s been COLD since mid-November! I have noticed today more ice on my streets and sidewalks. I am guessing these last couple of warmer days melted a lot of the snow and then overnight, it freezes again. Cool riding does scare me but ice on the roads does. You are a brave girl! I’ve been riding my mountain bike to work, instead of my regular single-speed commuter. Here in Idaho we have quite a bit of snow/ice on the streets, so I’ve found an alternate route which, while no less icy, is mostly on a bike/walking path and away from traffic. It increases my distance from 1.5 to 3 miles, but is a fun challenge. I ride with super-knobby 2.5″ mtb tires with reduced pressure which has been ok so far.